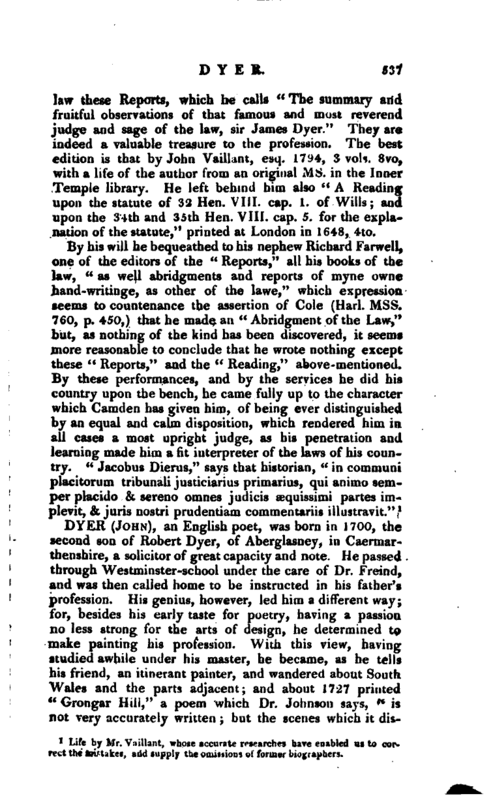 , an English poet, was born in 1700, the second son of Robert Dyer, of Aberglasney, in Caermarthenshire, a solicitor of great capacity and note. He passed through Westminster-school under the care of Dr. Freind, and was then called home to be instructed in his father’s profession. His genius, however, led him a different way; for, besides his early taste for poetry, having a passion no less strong for the arts of design, he determined to make painting his profession. With this view, having studied awhile under his master, he became, as he tells his friend, an itinerant painter, and wandered about South Wales and the parts adjacent; and about 1727 printed “Grongar Hill,” a poem which Dr. Johnson says, “is not very accurately written but the scenes which it | displays are so pleasing, the images which they raise so welcome to the mind, and the reflections of the writer so consonant to the general sense or experience of mankind, that when it is once read, it will be read again.” Being probably unsatisfied with his own proficiency, he made the tour of Italy; where, besides the usual study of the remains of antiquity, and the works of the great masters, he frequently spent whole days in the country about Rome and Florence, sketching those picturesque prospects with facility and spirit. Images from hence naturally transferred themselves into his poetical compositions; the principal beauties of the “Ruins of Rome,” are perhaps of this kind, and the various landscapes in the “Fleece” have been particularly admired. 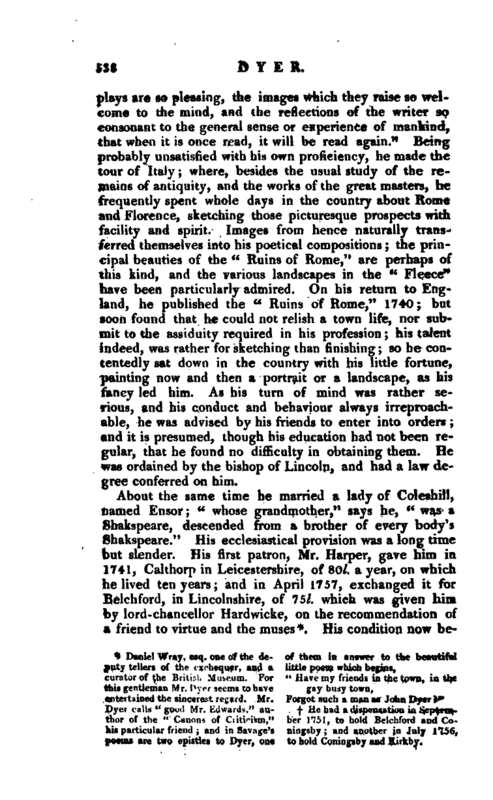 On his return to England, he published the “Ruins of Rome,” 1740; but soon found that he could not relish a town life, nor submit to the assiduity required in his profession; his talent indeed, was rather for sketching than finishing; so he contentedly sat down in the country with his little fortune, painting now and then a portrait or a landscape, as his fancy led him. As his turn of mind was rather serious, and his conduct and behaviour always irreproachable, he was advised by his friends to enter into orders; and it is presumed, though his education had not been regular, that he found no difficulty in obtaining them. He was ordained by the bishop of Lincoln, and had a law degree conferred on him. Forgot such a man as John Dyer?" His condition now | began to mend. In the year 1752 sir John Heathcote gave him Coningsby, of 140l. a-year; and in 1756, when he was LL. B. without any solicitation of his own, obtained for him, from the chancellor, Kirkby-on-Bane, of 110l. 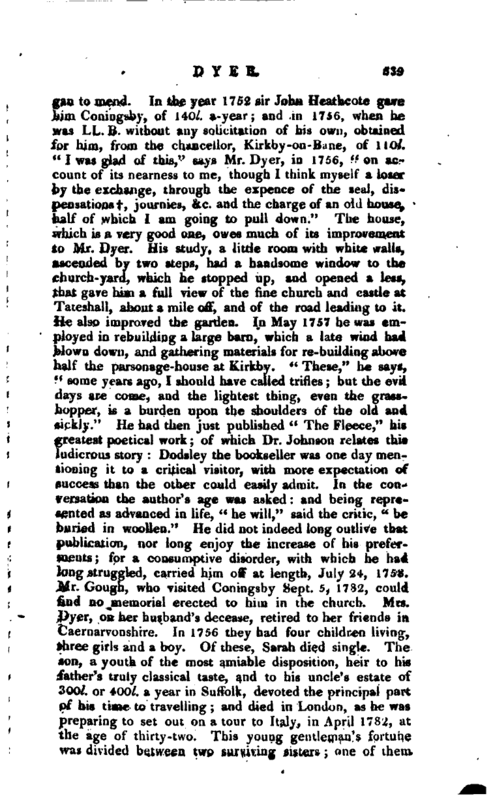 “I was glad of this,” says Mr. Dyer, in 1756, “on account of its nearness to me, though I think myself a loser by the exchange, through the expence of the seal, dispensations ,† journies, &c. and the charge of an old house, half of which I am going to pull down” The house, which is a very good one, owes much of its improvement to Mr. Dyer. His study, a little room with white walls, ascended by two steps, had a handsome window to the church-yard, which he stopped up, and opened a less, that gave him a full view of the fine church and castle at Tateshall, about a mile off, and of the road leading to it. He also improved the garden. In May 1757 he was employed in rebuilding a Lirge barn, which a late wind had blown down, and gathering materials for re-building above half the parsonage-house at Kirkby. “These,” he says, “some years ago, I should have called trifles but the evil days are come, and the lightest thing, even the grasshopper, is a burden upon the shoulders of the old and fickly.” He had then just published “The Fleece,” his greatest poetical work; of which Dr. Johnson relates this ludicrous story: Dodsley the bookseller was one day mentioning it to a critical visitor, with more expectation of success than the other could easily admit. In the conversation the author’s age was asked: and being represented as advanced in life, “he will,” said the critic, “be buried in woollen.” He did not indeed long outlive that publication, nor long enjoy the increase of his pre; ments; for a consumptive disorder, with which he had long struggled, carried him off at length, July 24, 1758. Mr. Gough, who visited Coningsby Sept.5, 17S2, could find no memorial erected to him in the church. Mr--. Dyer, on her husband’s decease, retired to her friends in Caernarvonshire. In 17.56 they had four children living, three girls and a boy. Of these, Sarah died single. The son, a youth of the most amiable disposition, heir to his father’s truly classical taste, and to his uncle’s estate of 300l. or 400l. a year in Suffolk, devoted the principal part of his time to travelling; and died in London, as he was preparing to set out on a tour to Italy, in April 1782, at the age of thirty-two. This young gentleman’s fortune was divided between two surviving sisters; one of them | married to alderman Hewitt, of Coventry; the other, Elizabeth, to the rev. John Gaunt, of Birmingham*. 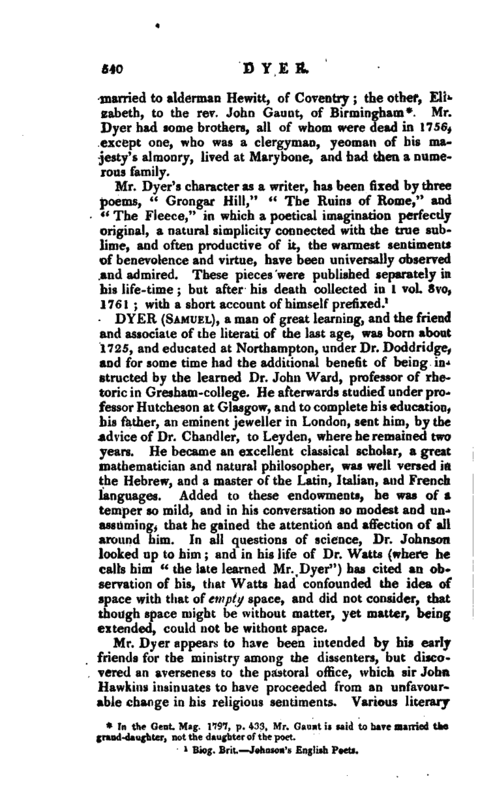 Mr. Dyer had some brothers, all of whom were dead in 1756, except one, who was a clergyman, yeoman of his majesty’s almonry, lived at Marybone, and had then a numerous family. Biog. Brit. Johnson’s English Poets.